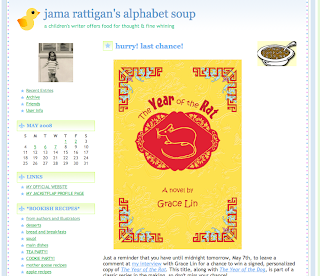 Author Jama Rattigan (DUMPLING SOUP) is presenting a wonderful series on her blog (which is appropriately titled Alphabet Soup), featuring recipes from children's book authors and illustrators. Check out this enlightening interview with Fusion Stories author Grace Lin (YEAR OF THE RAT), who shares her recipe for gingerbread cupcakes with candied ginger icing. YUM!